A unique product in which two goals are pursued: high degree of safety combined with the best user experience. The wireless E-stop is a product of Tyro Remotes which no longer is only in the Netherlands, but now is also being shipped throughout Europe. The Indus Gemini wireless emergency stop is designed in accordance with the ISO 13849-1 norm: PL c. With this smart safety solution the emergency stop button is always within easy reach. The chance of failure must be minimal. From a technical point of view, it is not surprising that many people consider the emergency stop button as the safest solution. Are the conditions in which your fitter/mechanic does maintenance or repairs really always safe? Can he/she easily reach the emergency stop button in case of an emergency? The fixed wired E-stop is usually mounted on the machine. In some situations every second counts, these precious seconds can be gained by using the wireless emergency stop. The person concerned could find himself in a difficult situation, being unable to reach the emergency stop button due to distance or being trapped, with all the consequences that follow. 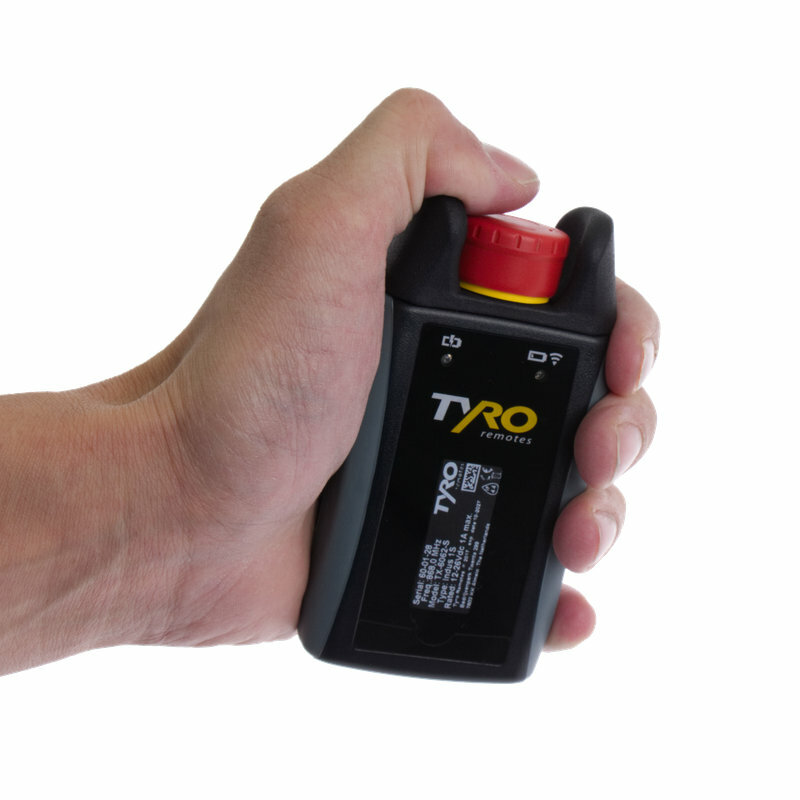 With the Tyro Remote Wireless emergency stop you anticipate these risks and thereby gain life-saving seconds. Also at schools the wireless emergency button ensures improved safety. The practical teacher cannot spend too much time on a pupil operating a machine, he gives advice, answers questions and generally does his rounds during the lesson. If an emergency occurs, the pupil could panic and not always know what to do. With an extra wireless emergency stop you anticipate and eliminate these risks. To prevent a false sense of security it is imperative that the system verifies that communication between the wireless emergency stop and the receiver is possible. Only in that case is it possible that another emergency stop signal can be given. Build up the hardware determines Performance Level. At Performance Level c a single and a double fault can be recognized by the system so that the safety function is not compromised. To achieve this, use is made of a redundant set up system, 2 processors are checking each other continuously to verify that there are no defects or errors. By applying these relays dangerous faults such as sticky contacts can be recognised safely. To further increase this safety the relays are doubled (redundant). Safety relays with forced contacts are used for installations that have a limited amount of safety functions and realise logical couplings, such as the emergency stop button. To prevent a receiver reacting to each radio signal on the right frequency, each wireless emergency stop is tuned to the receiver in advance. When a number of radio-graphically operated machines are next to each other and ID codes are not used it can result in machines reacting to the wrong signals. This is obviously creates a risk. The Indus Gemini features a 56-bit ID Safety Code; with which countless combinations are made possible, resulting in an almost non-existent chance of the same specific coding with two transmitters simultaneously. Also look at: Remotecontrol.help and Industrial Remote Controls. 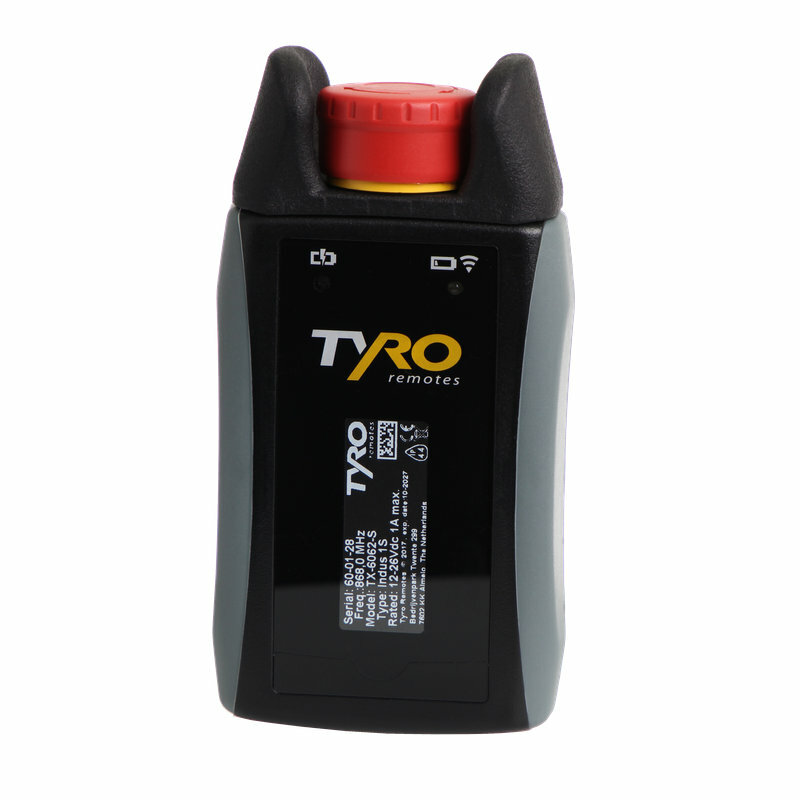 This site is part of Tyro Remotes, the specialist in industrial remote controls. With over 20 years of experience in the development and production of remote controls, we are the largest producer in Netherlands. Read more about us here. In addition to our wireless emergency stop, we also offer customized solutions in a large variety of sectors. Examples include remote controls for winches, pumps, M2M solutions and e.g. axle steering systems. Do you have a specific question? Our engineers provide answers for client-specific questions on a daily basis resulting in effective custom made solutions. Each application has its own challenges and that is where we would like to help you further.